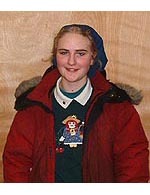 Chrystal Compare, 17, and her family moved to Fairbanks in 2000 with their eight sled dogs. People there helped them get better dogs and last year, Chrystal, with her dad’s help, trained for and ran the Jr. Quest. She says, “Thanks to my dad’s help, I am able to run this year’s Jr. Iditarod.” She is home schooled and in the eleventh grade. She enjoys sewing, painting and drawing. She doesn’t know what she’ll do after high school but says she will continue mushing.